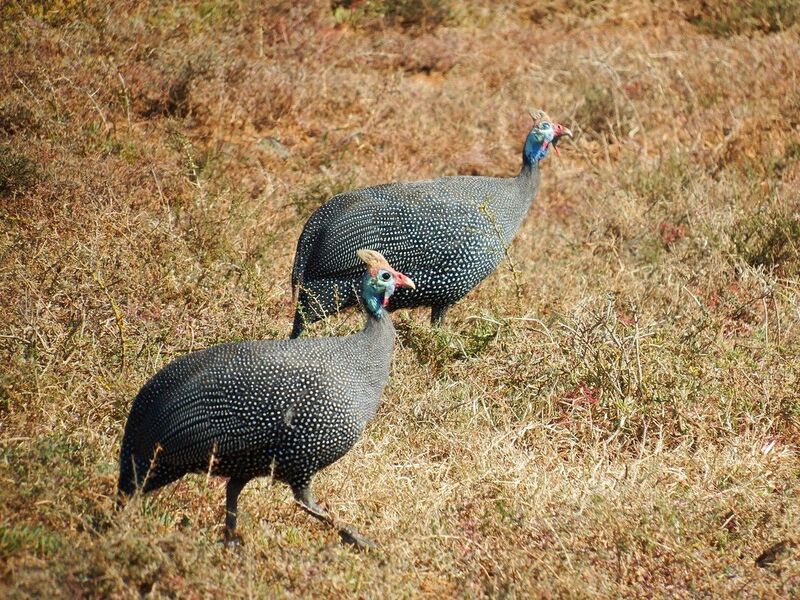 There is probably not a single South African who cannot recognise guineafowl. The horny helmet with blue and red bald head, slate-grey finely spotted body and characteristic hunched posture, are unmistakable. Helmeted Guineafowl are the most widespread gamebird in South Africa, occurring throughout the country with the exception of the Lesotho highlands and desert areas without surface water. They can be found in virtually any habitat in South Africa, the limiting factor being the availability of permanent drinking water and roosting trees. They benefit from agricultural practices and occur in large numbers on grain farms, which supply supplementary winter feed in combination with adequate roosting trees, wide and dense headlands, for breeding areas and a permanent supply of water. Where such conditions exist optimally they breed in exceptionally large numbers and particularly in those areas where they are not deliberately poisoned and where regular cropping is practised.